SonicMule (affectionately known as Smule) has released a variety of engaging apps for the musically-curious, including Ocarina, Leaf Trombone, and I Am T-Pain. The iPad provides a bigger surface for Smule to work with and it takes advantage of this added real-estate with Magic Piano, a $1 app that allows both musicians and musician-wanna-be’s to tickle the virtual ivories in a solo setting as well as with others around the world. You play Magic Piano in one of four ways—a black surface where you tap the screen and hear notes (either random notes or notes on a linear scale, depending on how you’ve set preferences), a spiral keyboard, a standard rectangular keyboard, and a round keyboard. You can adjust the range and number of keys of the latter three keyboards by pinching and dragging. 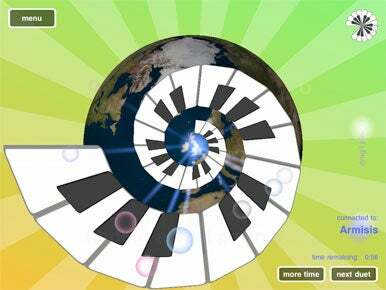 (Multi-)Player Piano: With Smule’s Magic Piano, you can tap out a duet with another iPad user chosen at random from around the globe. Using these input methods, you can play solo or—in Duet mode—with another Magic Piano player chosen at random from around the globe. You can also select Songbook and tap out one of 17 songs, including such chestnuts as Clair de Lune, Fur Elise, Moonlight Sonata, and Flight of the Bumblebee (demonstrated by Chinese pianist Lang Lang at a recent performance at San Francisco’s Davies Symphony Hall). Like other Smule apps, you can listen to snippets of other people playing by tapping the World button. Non-musicians will find Magic Piano a load of fun and, possibly, instructive. As far as fun goes, the ability to tap on the iPad’s screen and hear something musical come out without having a stitch of musical training is bound to be satisfying. And if you want to play some of those tunes “correctly,” Magic Piano can help compel you to be more precise with the timing (rhythm) of the taps. And if you’re one of those people who can’t help banging out “Chopsticks” or “Heart and Soul” when you pass by a keyboard, you’ll find the same pleasure on your iPad. Trained keyboard players will find both joy and frustration in Magic Piano. It’s completely joyful to connect with another Magic Piano player and work out a duet with no way to communicate other than by tapping on the keyboard and finding that your duet partner understands that you’re playing an accompaniment part and their job is to supply a melody. The current frustration is that, as far as I can tell, there are very few Magic Piano players who actually have any experience playing the keyboard. For the most part, the duet partners I’ve encountered sound like cats randomly batting at the iPad’s screen. A “No, seriously, I can play” channel that brings together musicians would be welcome. Also, it’s not always easy to hit the correct keys—accidentals, in particular. In order to have the range of a couple of octaves, you have to shrink the keyboard to add keys, making your targets pretty tiny. In that “No, seriously, I can play” mode, it might make sense to make the black keys more forgiving when you play near them. After all, if you’re playing white keys on a traditional keyboard (versus the spiral or round keyboard), you tend to play them at the bottom of the key rather than “in the cracks” between the black keys. But these are the gripes of a trained keyboard player who wants more musical power from a charming application intended for non-musicians—many of whom desire nothing more than to interact with their iPads in more harmonious ways. For those people, Magic Piano is worth far more than the single dollar Smule demands.